Luke Bolin and I have been working on a design for our mailing piece that we will be sending to the community in August. I feel like he hit a home run with this design! 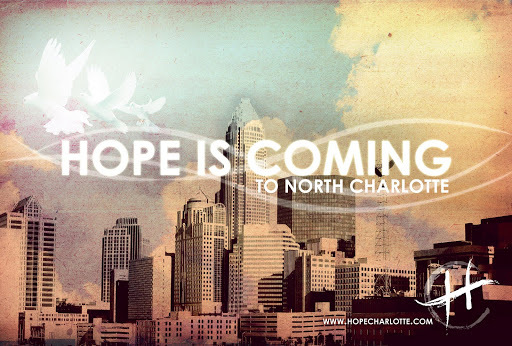 We will send this postcard to 50,000 people to promote the launch of Hope Church. I wanted to go with something that was very strong graphically. Less information and more creativity to stir up interest. I am a big believer that people are over saturated with information. I want all of my design pieces to simply communicate the main points and let the design speak for itself. 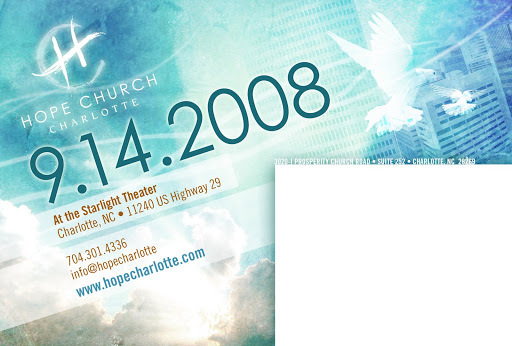 On this particular piece, I want people to be so intrigued by the church that sent this card out that they go check out the website for more. duke, that looks great! i love the phrase on the front! yeah…that’s a part of a whole marketing campaign we’re doing. we launch on sept 14…so excited!! !